looked forward to since becoming a mom. 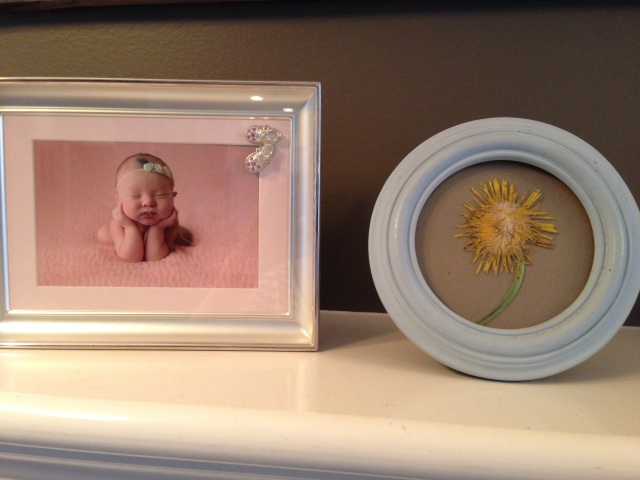 To preserve that sweet moment, I decided to frame the flower. It’s a simple enough craft to do with young kids, and one that made my daughter incredibly proud to be a part of. Step 1: Ensure your flower is completely dry before pressing it, otherwise it might turn moldy. Place it on the right hand side of your parchment paper. make sure the flower petals are fanned out and completely flat. Step 3: Place your heavy books on top and store them in a dry place. Step 4: After two days, check your flower. If it’s completely dry and flat, it’s ready to be framed. for a few more days until it’s completely dry. a bit of glue to the stem. Step 6: Press the flower on the cardboard backing of your frame. Now you have an adorable keepsake to remind you of that special moment with your wee one. Angela Robertson: When she's not spinning records for her two-year-old daughter and one-year-old son, she's busy writing about them on my blog Rock ’n’ Rattle. For the past several years she worked as communications writer, but recently decided to stay home with her kids and work as a freelance writer. That is, if she can ever get the songs from Disney’s Frozen out of her head.